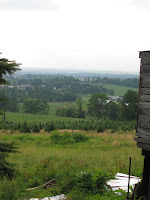 On Sunday, I took a trek to the mountains in Maryland to visit a friend of mine who was visitng the area. 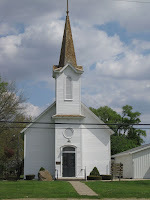 We met up at her sister Mary's house. 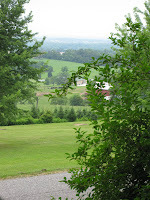 Mary has an absolutely gorgeous view from her front porch looking out towards Hagerstown, MD Since several of us had birthdays in May and June, we decided to all get together to hang out and have a cookout. 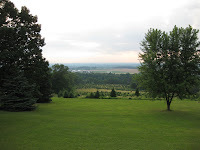 I can't think of a better location for a cookout - the view and the weather were perfect! 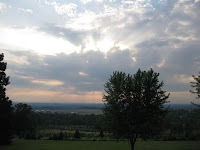 The views from Mary's front yard are magnificent! It was a bit hazy, but I could still see some far off mountains. On a clear day, she can see mountains in both Pennsylvania and West Virginia from her front porch. 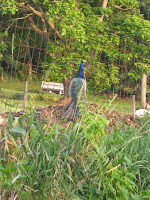 Two doors down from her are some llamas, miniature horses, a draft horse, some Jacob Sheep, and a couple of peacocks. 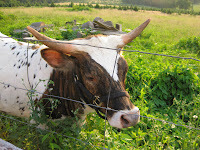 Across the road, there was a very sweet cow that loved to be pet. 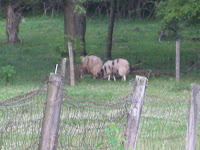 The brindle faced darling followed me along the fence line, just like a dog would! I had a hard time getting a good front view. 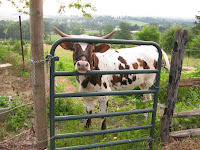 This cow was definitely a sucker for attention! What a sweetie! 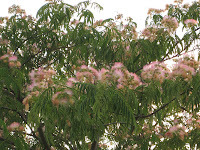 Next to the cow's pasture was a mimosa tree. I've seen them before, but never really knew what they were. I love the blossoms - very intriguing! 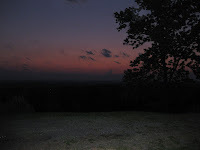 The sunset views from Mary's front porch were awesome! 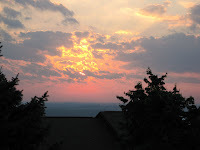 Each time the sun shifted positions behind the clouds, we got a fresh and magnificent display of lights and colors. These photos don't even come close to the beauty we saw first hand! These show the progression of the sunset...be sure to click on each photo for a better view - especially the final one as the colors aren't really evident in the small rendering. I had potato leek soup with smoked scallops as an appetizer. I'd never had smoke scallops - they were quite good! That was followed by an absolutely fabulous entree of sea scallops with saffron Israeli couscous. The sauce for the scallops and flavoring of the couscous was wonderful! I finished off my meal with Rhubarb/Raspberry Creme Brulee. The fruit flavoring was very subtle, and the custard was fantastic! After dinner, we wandered out on the terrace where I took some photos of the Potomac River and some Washington, DC landmarks. 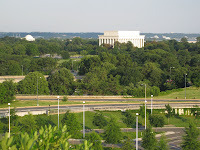 The domed building on the left (in the distance) is the Jefferson Memorial. 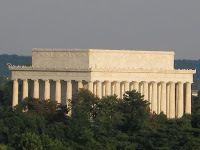 The rectangular building is the Lincoln Memorial. 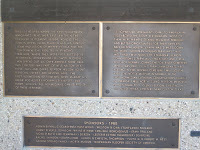 The photo on the right is a closer view of the Lincoln Memorial. I love the detail on the outside of the memorials. 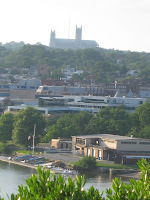 In the distance, at the top of the hill, you can see the National Cathedral. It was a bit hazy...especially over the water and facing west. 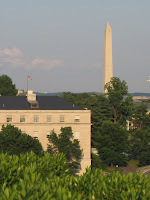 The second photo has a view of the Washington Monument. 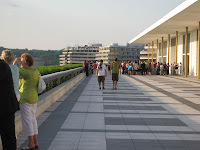 The photo on the left has a view looking down the terrace of the Kennedy Center toward the Watergate...the scene of the infamous Nixon era Watergate break-in. 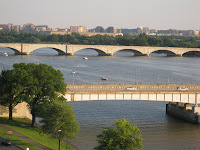 The second photo is a river view...I love the arches on the 2nd bridge - the architecture is lovely! 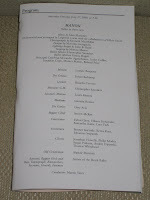 The ballet was wonderful. The costuming was incredible - from the very simplistic to the exceedingly elaborate. And the dancing....oh, the dancing! I could not believe some of the routines! The elegance coupled with the sheer athleticism was awe inspiring! If you've never experienced a ballet in person, it's definitely a "must do". Many thanks to Lisa for such a wonderful evening! Thursday night, I had a fabulous time at the Lincoln Theater in Washington, DC. 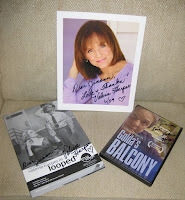 My friend, Paula and I had a "girls night out" and went to see a wonderful play, "Looped"....starring the very talented Valerie Harper. The theater is absolutely beautiful inside. We had fabulous seats...but in all honesty, I don't think there's a bad seat in the house! The play was absolutely fantastic! Lots of laughs and an exquisite performance by the exceptional cast. Valerie's was perfect as Tallulah Bankhead. You definitely don't want to miss this show! Tonight and tomorrow are the final performances, so you'd better hurry!!!! Paula and I stuck around after the play to purchase Valerie's DVD, "Golda's Balcony" and then waited for her to come out to the lobby so we could chat with her. Valerie was very warm and down to earth - an absolute delight to be around! I've always admired Valerie - I'm glad I finally got to meet her in person! The theater is next door to a very famous Washington, DC "hot spot" - Ben's Chili Bowl. Bill Cosby frequents this venue whenever he's in town. President Obama has eaten here as well. The photos and paintings are a wonderful pictorial history of interesting people that have frequented this eclectic restaurant. Of course, Paula and I "had" to go in and try one of these famous chili dogs! I had mine "loaded"...and it was so good! Their fries are great too. I think that I'll try a milk shake with my chili dog the next time. And yes...it was very good, so there definitely will be a next time! 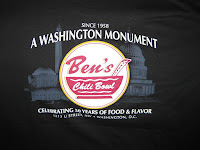 Oh...and to remember my visit to Ben's Chili Bowl, Paula gifted me with my very own Ben's T-Shirt for my birthday! What a sweetie! Thanks Paula! Yes.....Ku Ku Dolls. These little felted dolls are absolutely adorable! I don't have any reason to buy these or make these - no grandkids and my youngest niece is already 10! But they're just soooo cute! 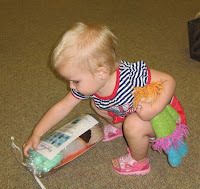 My friend, Amy, made one of these.....and as you can see, it's a dearly loved addition to this young lady's toy supply. 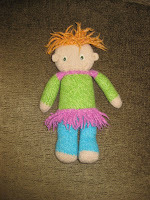 Most people felt using their washing machines, but Amy didn't bother with that....she felted this little doll by hand! 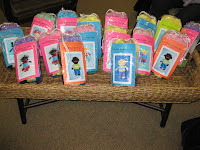 These little dolls knit up and felt quickly and are just so cute! I've been thinking about them all week - ever since I spotted them at Nature's Yarns. I definitely have to purchase one. Actually, I should probably get two....I don't want them to be lonely! Secret Pal 14.....Signups extended until Monday June 22! The signups for Secret Pal 14 have been extended to Monday, June 22! 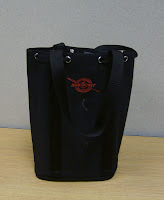 If you want to participate, hurry on over to: Secret Pal 14 Blog sign-up, and join the fun! 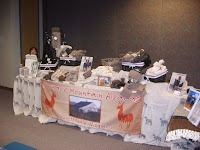 At our last Purls of Distinction meeting, we had Sharon of Furnace Mountain Alpacas as our guest. What a fabulous time we had! 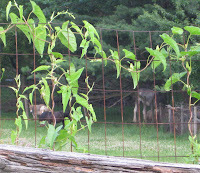 We all learned a lot about Alpacas....and fondled tons of lovely yarns and projects. You can see Sharon just peeking over the patterns on the far left. Oh...did you notice the fabulous fabric she has as a table drape? Double click on the photo for a closer look - it's PERFECT! The fabric was custom made for her. Sharon does NOT dye any of her yarn - it's all naturally colored. 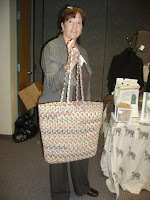 Her main reason for leaving the color in its pure form is to maintain the hypo-allergenic nature of the Alpaca fiber. This makes Alpaca the perfect choice for those that want warm, woolly sweaters, but need to avoid sheep's wool and/or goat's wool due to allergies. 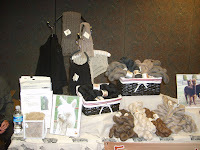 I feel very fortunate as I can snuggle up to any of the animal fibers - wool, mohair, cashmere, angora, and alpaca. On with the educational portion of Sharon's presentation - all about the alpacas and their wool. 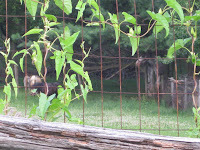 About the animals: Alpacas primarily came from Peru and were imported in the 80's. The importing of alpacas stopped in the late 80's as the focus shifted from importing to breeding and developing US herds. They can't be artificially inseminated. Alpacas can't be alone - they need a buddy. They also like to "play". Sharon has an obstacle course set up so her animals can "entertain" themselves. They are also very heat sensitive, so their barns need to be kept cool. 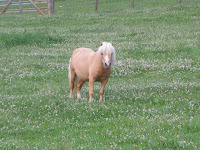 They can also be sprayed with water on their bellies and tails to keep them cool. Pregnant alpacas tend to have hormone issues. I'm sure many of us can identify with those "pregnancy hormones"! They have an 11 1/2 month gestation period - ugh! Can you imagine? 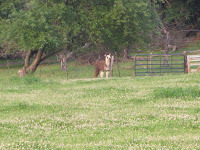 During pregnancy, alpacas need to be kept away from pasture fescue as it's not good for a pregnant alpaca. Generally, the alpaca will produce about 5 lbs. of "wool" per year. It can be as much as 8 lbs. if you count all of the fiber - including that from the head, legs, etc. Most of the guard hairs tend to be on the stomach. 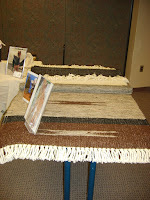 The leg and neck wool is perfect for rugs and bags - basically non-apparel. The alpaca is part of the camelid family - camels, llamas, alpacas, vicuna. There are two basic types of alpacas. Huacaya - the fluffy "teddy bear" alpaca with a very lofty fiber. There are approximately 150,000 of these in the US. Yarns made with this fiber are a bit warmer and loftier than the Suri. It's perfect for scarves, hats, and sweaters. Due to the loft and crimp, it has memory. Suri - these tend to be a bit stringier and are harder to get fiber from. There are about 20,000 of these in the US. Yarns made with Suri fiber lack memory. However, the sheen of yarns made from this fiber is fabulous and makes it perfect for lace projects. 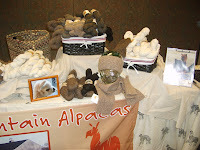 TIDBIT OF THE DAY - Did you know that "Baby Alpaca yarn is NOT from baby alpacas? It's actually based on the micron rating of the fiber, not on the age of the alpaca the fiber is from. 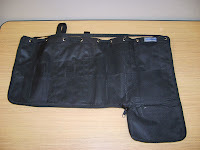 More about the fiber and yarn: The crimp in the fiber gives it the loft. Also, the scales are parallel to the fiber, making it much less scratchy to the skin. (I still remember the very scratchy woolens that I grew up with! Thankfully, we have a lot more choices now!) When processing the fiber, you need to watch for guard hairs - the older alpacas have more guard hairs than the younger ones. Approximately 50% of the softness of the yarn is due to the fiber itself and the remaining 50% is a result of the spinning process. Her yarns are spun commercially, but it's definitely an art, not a science to produce wonderfully soft, lofty yarn. 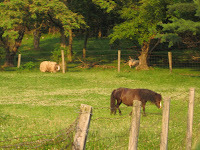 One of the places she uses for processing is Georgia Mountain Fiber. She's especially keen on them because they have a dehairer - this removes a lot of hair and debris in the process. There were many weights and natural colors her Alpaca yarns - and an unbelievable number of patterns to go with each of them! The patterns are very basic and straight forward - perfect for both beginners and more experienced knitters. I was definitely inspired and purchased some yarn for three projects - fingerless mitts, a scarf and a shawl. I also bought 2 cria fleeces - the fiber is sooooo incredibly soft! A cria fleece is the first clip from a baby alpaca. I purchased both Shelby and Morgan). Wish me luck - I've never spun pure Alpaca before, so this could be quite a challenge! Of course, anytime anyone wants to get "up close and personal" with Sharon's fiber flock, they just need to give her a call and she can set up a visit. I believe my guild will be planning a trip out to Furnace Mountain Alpacas for an "animal and fiber visit" in the not-to-distant future. It should be a lot of fun! The drive back to Virginia was a bit wet...and occasionally stormy. The midwest has been inundated with rain. In fact, it rained nearly half of the time we were there. 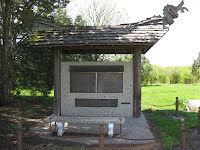 Many fields were full of water or had"natural ponds" where the corn should have been planted. The farmers are having a really rough Spring. Hopefully it will dry out soon and they can get the fields planted before the planting season is a total loss! The rainy weather stuck with us through most of the ride home. 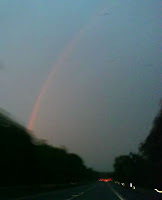 Once we got off of the PA Turnpike, the weather started to get a bit stormier. But, as we soon found out, there was a light at the end of the tunnel - literally! In spite of all the storms and the impending night, there was just enough sunlight able to peak through the clouds and over the mountain tops to produce a beautiful sunset rainbow. 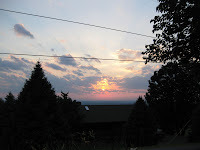 DH had to use my cell phone camera to try to capture it's beauty before the last bits of sunlight escaped to the other side of the mountain. Amazingly, it came out much better than either of us expected. The photo isn't nearly as stunning as the rainbow was in real life, but at least it captured some of its beauty....and preserved it forever. 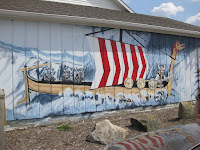 I missed all the celebrations this year for Sittende Mai with my Sons of Norway lodge as I was in Illinois. 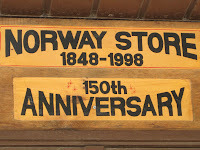 However, I was quite near a town called Norway, so I stopped by there to get my "Norwegian Fix". 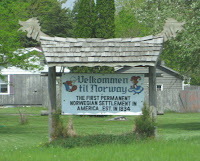 The town of Norway was the first permanent Norwegian settlement in the US - established in 1834. I paid the general store a visit and picked up some goodies like Fruit Soup mix, pickled herring, and of course, some yummy lefse to share with the family. I managed to find a really cute sweatshirt and a T-shirt and cup that say, "Lefse Queen". 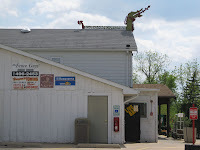 I love the roof line - other than that, it's a rather standard looking general store. I was a bit disappointed though because I couldn't get any Norwegian Akavit....only the Danish brand. 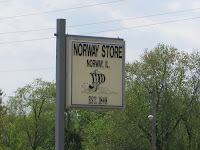 The only major item(s) missing from the store is some Norwegian wool or at least a few knitting patterns. I'm sure I'm not the only patron that would be interested in those goodies. 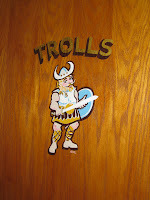 The visit to the bathroom at the Norway Store was quite interesting as well. 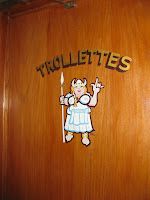 The doors are labeled, "Trolls" and "Trollettes". 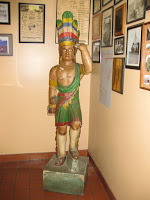 In the hallway, you're greeted by a wooden cigar store Indian and lots of interesting photos on the walls. 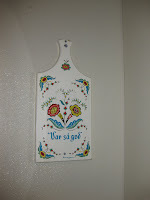 Inside the bathroom, the Norwegian theme continues with the saying, "Var sa god". I'm not sure it's really appropriate in the bathroom, but it made me smile none the less. 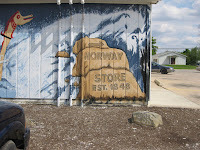 Just outside the store is a mural depicting the seafaring Norwegians. They've recently touched up the painting. The last time I was here, I remember it being a bit faded. Off in the background is the Norwegian Church and museum. Unfortunately, I wasn't there during "visiting hours". The museum is only open from June through September, so I was there a month too early. 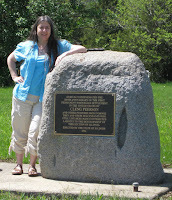 Just down the road from Norway is the Cleng Peerson Memorial. 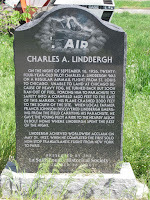 I stopped there to read up on the history and pay my respects. I tried to catch the flags in full splendor, but the winds just weren't cooperating with me that day! Of course, I can't drive up Rt. 71 to Norway without oggling the "monument" left by the Norwegian farmers in memory of the great farm crash of the 1980's - a crashed plane. 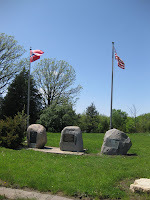 Many farmers lost their land and homes during that time period....and quite a number of them were of Norwegian descent.